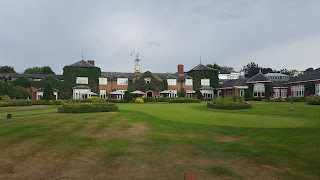 The 2018 Golf Society of Great Britain AGM took place at The Belfry, Sutton Coldfield on 26th/27th July. Seventy one members enjoyed good weather for the duration of their stay with temperatures reaching 34 degrees on Day 1. Thankfully temperatures dropped into the mid twenties on Day 2 to the relief of everyone as this rarest of summers continued to deliver hot and dry weather. Both golf courses are relatively modern parkland designs. The PGA National being a more open and mounded design which looks almost like a links course with most fairways looking very brown indeed. However, the world famous Brabazon course, home to four Ryder Cup events, was very green indeed with trees, bunkers and water combining to make this very tough proposition for all. Fast, sloping greens and a number of very difficult pin positions only added to the challenge. The scores on the PGA National were generally quite good but the Brabazon was a completely different story with no one managing a score in the thirties. The accommodation and facilities of the Hotel are of the highest order, the Pro shop being one of the biggest in Europe with enough stock to interest everyone. The food was also excellent throughout our stay. At the AGM our outgoing Chairman, Mr Robin Moser, was presented with two engraved GSGB tankards in recognition of his three year term as Chairman. The Handicap Cups for the best two day aggregate scores were won by Giles Hinchcliffe (Sand Moor) retaining the trophy with 55 points and Liz Clark (Effingham) 53 points. Ian and Celia Edwards with 104 points, claimed the "Enjoy Golf Together Trophy" by having the best husband and wife aggregate score over the two days. We were joined at Dinner by Alastair Cochran who along with John Stobbs wrote "The Search for the Perfect Swing", the book being commissioned by GSGB founder Sir Aynsley Bridgland 50 years ago in 1968. Alastair spoke about the beginnings of the book and his life in golf thereafter before being presented with an engraved whisky glass. Our new Chairman, Mr Giles Hinchcliffe presented the prizes and the full list of winners can be found below. Our next Meeting will take place at Camberley Heath GC & Army GC on August 28th/29th. The 2019 AGM will be held at East Sussex National. Here are the photos from the AGM.